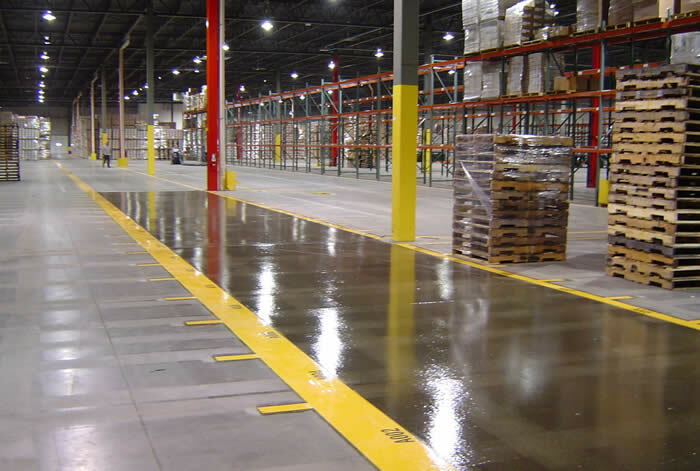 Striping and numbering on concrete floors is an important objective for a facilities manager in warehouse, distribution or manufacturing facilities. One of the most effective ways to promote safety is to create traffic of forklifts and pedestrians isolation with striping and floor marking by Concare in conjunction with a new flooring installation. If striping is all you need, projects that are 4,000 linear feet or more is where Concare's work quality shines. There are numerous ways to create striping and numbering safety on the warehouse floor: different colors, diagonal stripes, 'stop' guides, arrows, forklift or pedestrians signage. If your company currently has a safety standard for floor markings, consult the guidelines and allow Concare to review the criteria. We have performed striping and numbering for many companies to conform to their corporate standards and guidelines. There are times when the facility needs to develop their own standards for striping and numbering for safety. Concare can help you identify critical areas and partner with you to create standards unique to your company's situation.